A snowbird is a person who prefers going to warmer sunny states in winter. For sure, cold is something not everyone can enjoy. So some of us choose to leave home and spend winter months in places like California and Texas. The process of going away for winter can be like relocation itself. You’re leaving for a long time, so you have to take a lot of things with you. And you probably will want to take your car, too. You want to feel like home in the sunny place where you’re going. And here’s where we can help you with Snowbird Transport Services. Going to spend your winter in San Antonio? Our company will be happy to assist you with San Antonio Car Shipping. 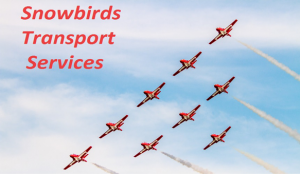 We provide reliable Snowbird Transport Services. We can ship any vehicle to or from San Antonio for your Snowbird Transport. It is really easy! You can choose Open or Enclosed Car Transport. We will ship your vehicle door-to-door safely and securely. Planning on living in your RV? We can help you with that too! You don’t have to drive all the way to Texas. It is way simpler just to book our Snowbird Transport Services. We will ship your house on wheels hassle-free for you! No gas expenses, no long hours of driving. We will make it easy for you! We can ship any vehicle for you with our Snowbird Transport services. Our rates are quite affordable. We provide high-quality San Antonio Car Shipping for the best price for this kind of services. With our company, everything is taken care of! We are looking forward to your Snowbird Transport! Let us ship your vehicle and help you on your way to sunny San Antonio. We will also be happy to help you on your way back!